Promotional Scratchcards - How Does It Work? Promotional Scratchcards	Online - How Does It Work? To keep track of the games (winners, losers and games played) we'll host the game for you on our servers BUT branded with YOUR identity. So you won't need to do anything technical to run a scratchcard promotion. Each promotion is compartmentalised and individually branded with a series of pages unique to you. The promotion pages carry your graphics and personal promotion message with the game and prize structure. There are then "winners" and "losers" pages which carry (your) instructions on what to do next. You'll find a series of "How it works" videos here. You have 2 options for delivering the promotion to your target market: E-mail or via a link on your website. Website links are best-suited to an "open to everyone" promotion: you add a promotional message to your website with a link to the game page (on our servers). That way, anyone visiting your site can enter simply by following the link. E-mail delivery will work well for a "closed" promotion where you want to limit the game to a specific group of people - whether they're customers, employees or a database of prospects. Both e-mail delivery and web link responses are monitored by the system using a unique-to-your-promotion set of codes which means we can provide accurate details of how many people have played the game, how many win/lose combinations have been played and how many games are still available to be played. If you choose the e-mail delivery option we'll happily handle the actual mailing for you. The system automatically allocates a unique game code to each e-mail addressee. The e-mail then has a link to your promotion start page where the addressee enters the code provided to access and play the game. If you would prefer to keep control of your e-mail data and do it yourself, we'll provide a file with the codes to allow you to do just that. 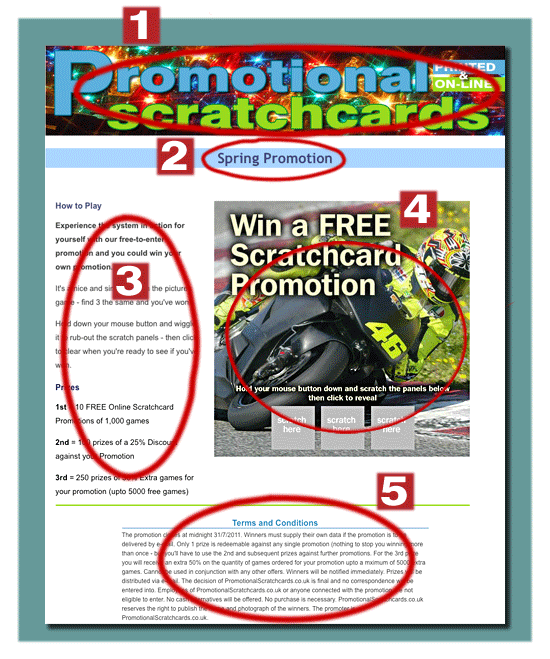 Download our Free guide: "Scratchcards: The Perfect Promotional Tool"